No complaints about the very springy spring we’ve been enjoying here in southeastern Pennsylvania. For the most part, the temperatures and rainfall have been almost exactly average; we even got what I hope is our last frost two nights ago: right around the time of our last frost date. As of this morning, all of the plants that have packed my office, kitchen, and unheated greenhouse for the last few days and nights are finally moving outside for good. 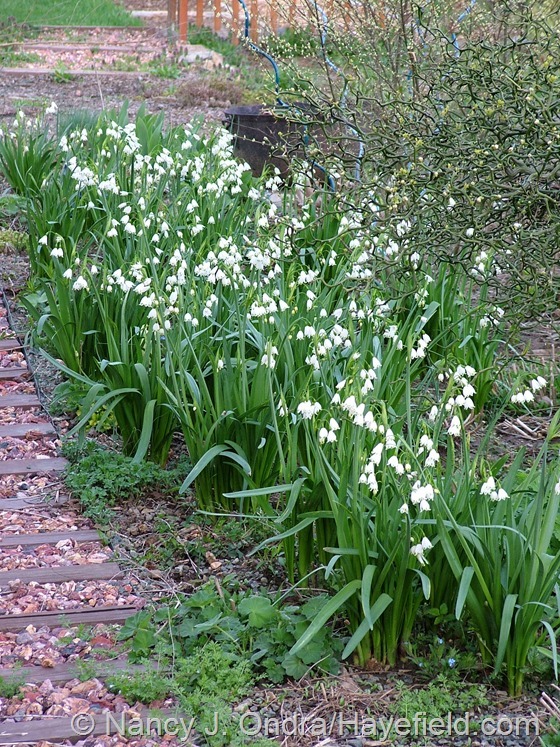 The cool days and nights have been super for the bulbs, like the ‘Pipit’ daffodils above and the ‘Gravetye Giant’ summer snowflakes (Leucojum aestivum) below. 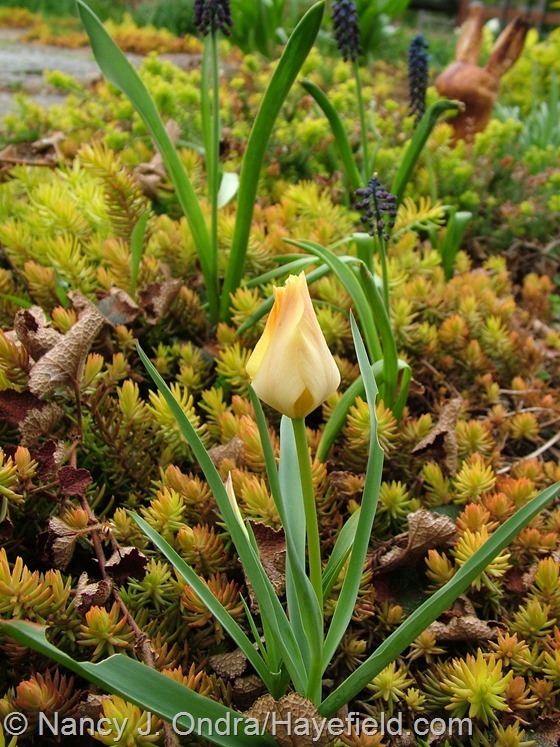 Between the winter-wet soil and the rabbits, I don’t have much luck with tulips, but tiny Tulipa batalinii ‘Bright Gem’ seems to be doing ok at the edge of the stone-and-gravel path in the courtyard. 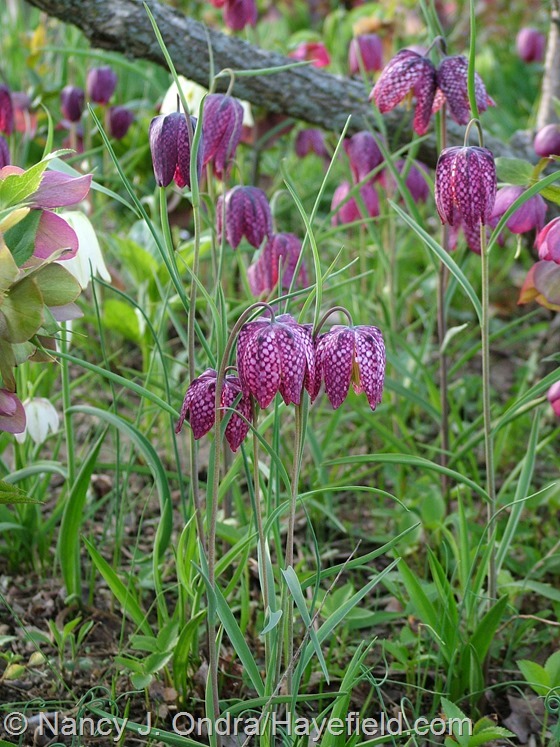 Down in the shrubbery, the guinea-hen lilies (Fritillaria meleagris) have settled in happily and seem to nearly double in number each year. 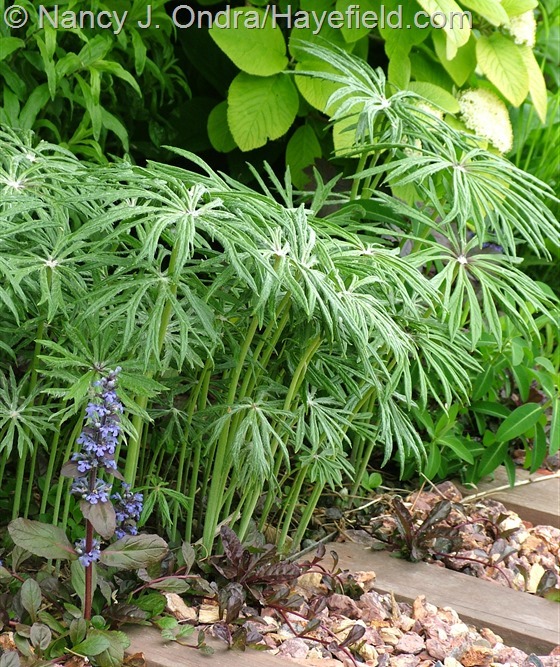 There are a few early-blooming perennials showing now, including fernleaf peony (Paeonia tenuifolia) and Chocolate Chip ajuga (Ajuja reptans ‘Valfredda’). Above, Lamium orvala (looking somewhat like a demented pink dragon, if you use your imagination); below, variegated lily-of-the-valley (Convallaria majalis ‘Variegata’). 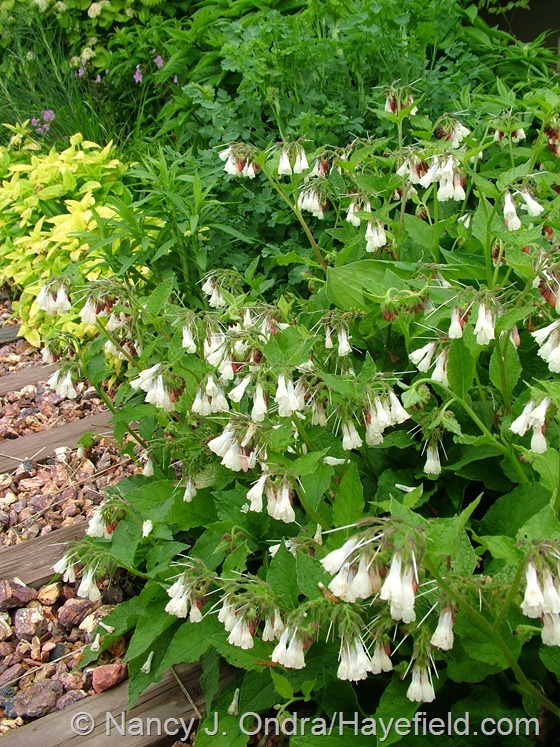 Above, mukdenia (Mukdenia or Aceriphyllum rossii); below, dwarf comfrey (Symphytum grandiflorum). 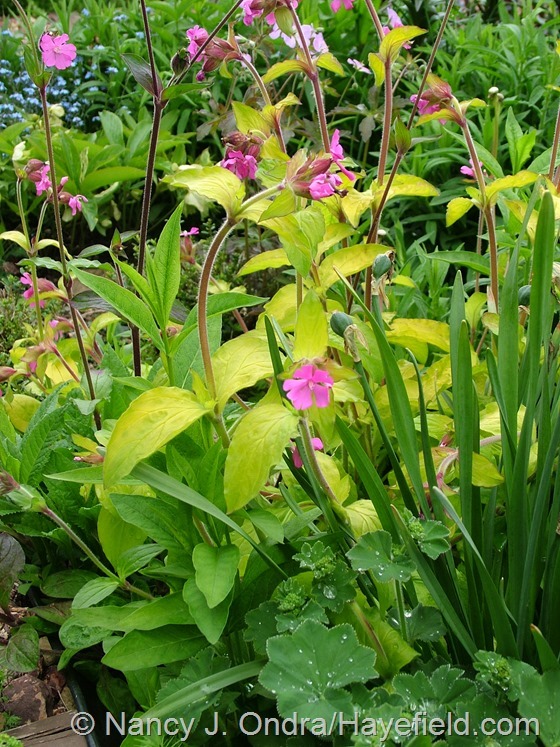 And above, Silene dioica ‘Ray’s Golden Campion’. 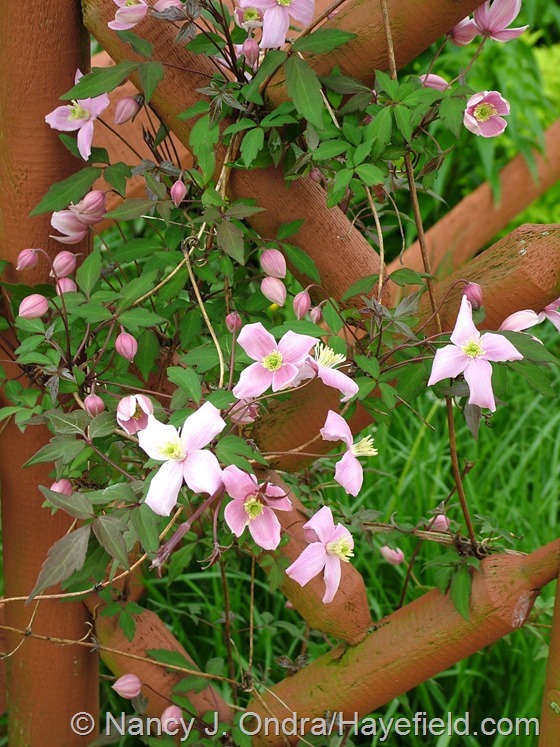 Just one vine in flower now: blooming for the very first time, pink anemone clematis (Clematis montana var. rubens). 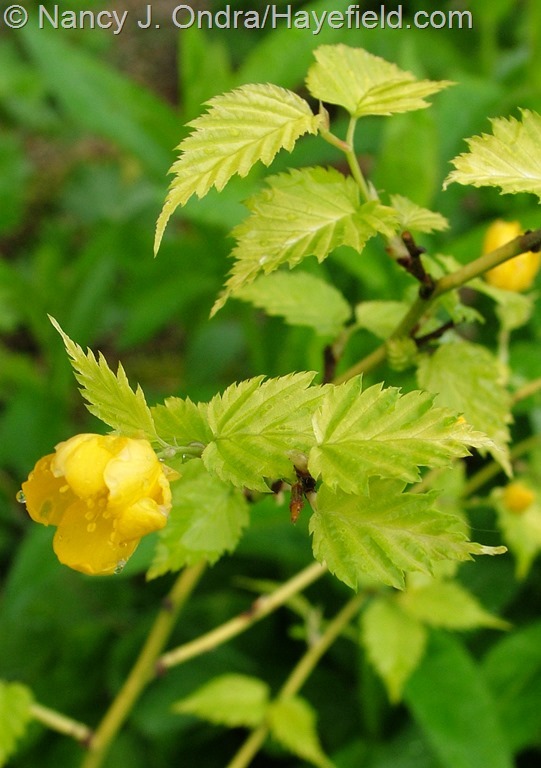 Among the in-bloom shrubs are a white currant (Ribes rubrum) above and ‘Chiba Gold’ Japanese kerria (Kerria japonica) below. 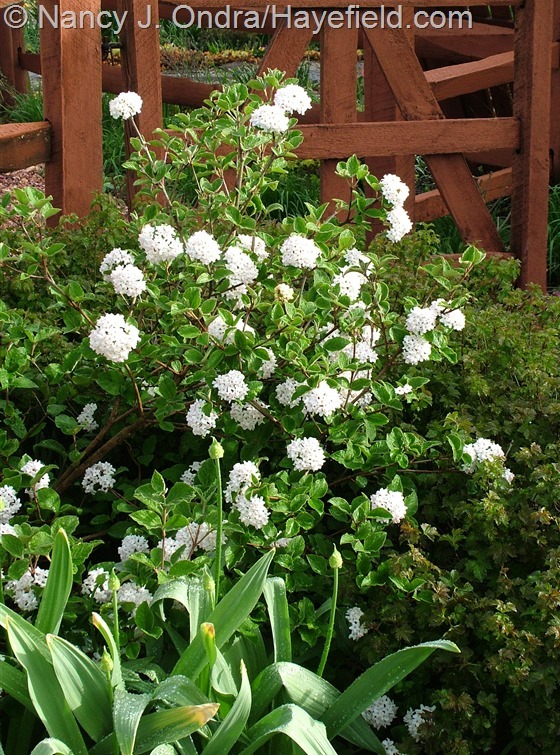 Above, compact Koreanspice viburnum (Viburnum carlesii ‘Compactum’). 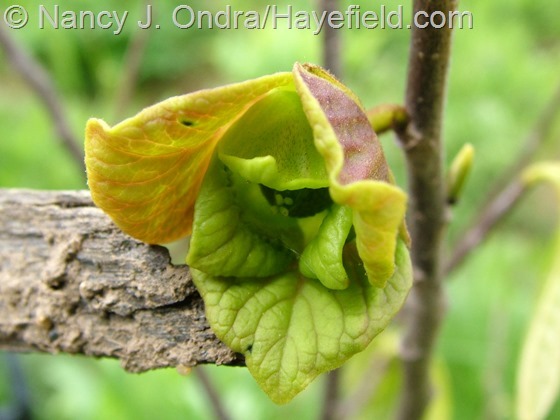 And below, the pinnacle of excitement for me so far this year: the very first flower on any of the pawpaws (Asimina triloba) that I’ve been trying to get established here. It’s very unlikely to set fruit, since none of the other seedlings have shown an inclination to flower yet, but it’s a promising start on a plant that’s just 3 feet tall. 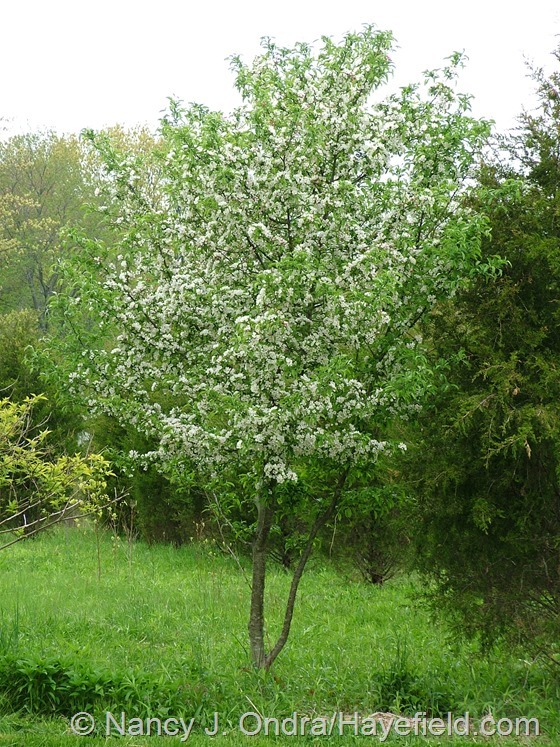 The crabapple (Malus) below is not nearly as thrilling, but it makes me happy for the opposite reason: I had nothing to do with planting it or getting it to this stage. There are now nearly a dozen like this scattered throughout the meadow areas, all planted by the birds and growing vigorously despite being surrounded by hundreds of eastern red cedars (Juniperus virginiana) loaded with the orange galls that produce the spores of cedar-apple rust. This post marks the first time this year that I have a decent showing of lovely leaves for tomorrow’s Foliage Follow-Up. 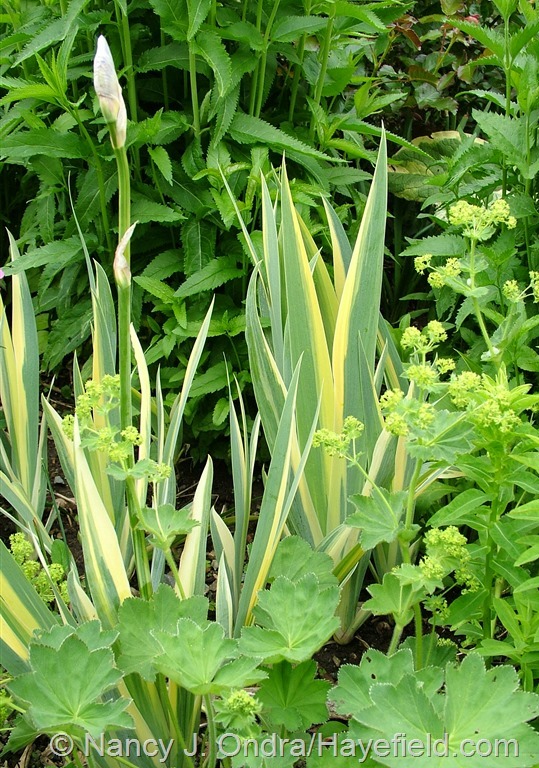 Above is yellow-variegated sweet flag iris (Iris pallida ‘Variegata’); below is the white-variegated version (‘Argentea Variegata’). 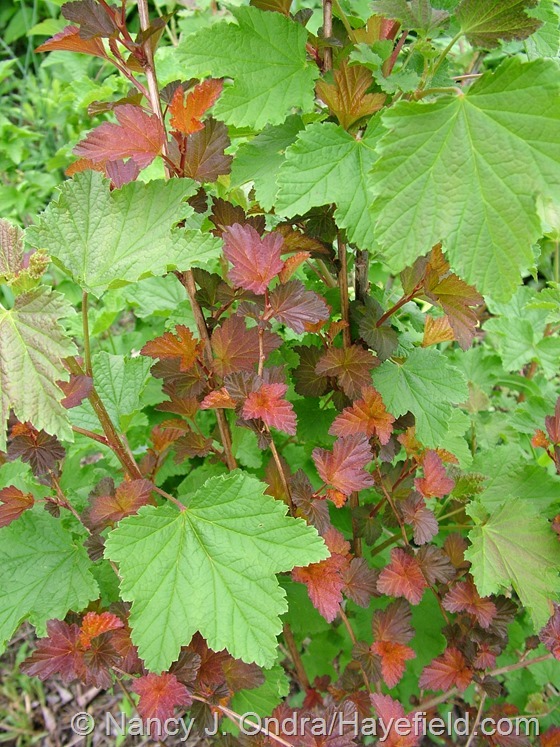 And below, a little vignette from one of my holding beds, with the mingled leaves of a seedling red currant (Ribes rubrum) and a seedling ninebark (Physocarpus opulifolius – probably a cross between Diabolo and ‘Dart’s Golden’). Down at ground level, there’s a yellow-leaved thyme (sold variously as ‘Transparent Yellow’, ‘Yellow Transparent’, ‘Transparent Gold’, or ‘Clear Gold’); below, ‘Elizabeth’ two-row sedum (Sedum spurium). 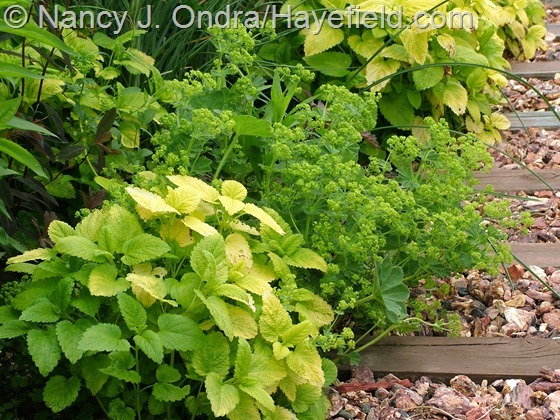 Now for some combinations, starting with ‘All Gold’ lemon balm (Melissa officinalis) and lady’s mantle (Alchemilla mollis) above. 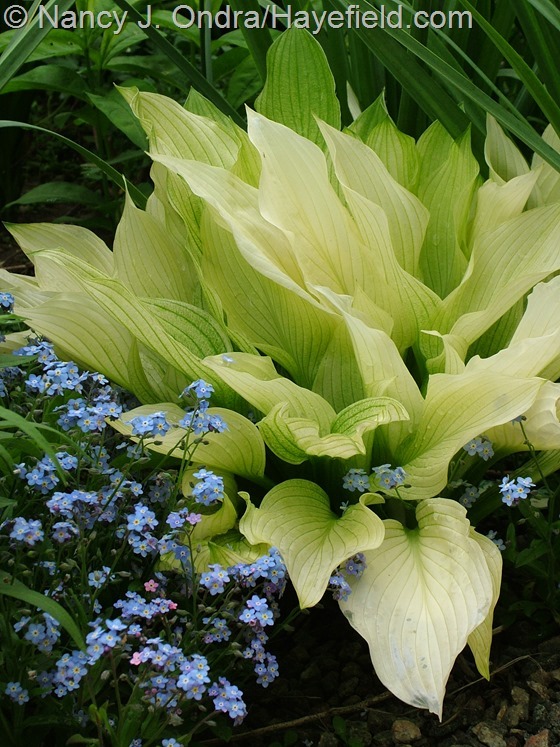 Below is ‘Mostly Ghostly’ hosta with forget-me-nots (Myosotis sylvatica). Above, ‘Britt-Marie Crawford’ ligularia (Ligularia dentata) with the purple sepals of a hybrid hellebore (Helleborus x hybridus). 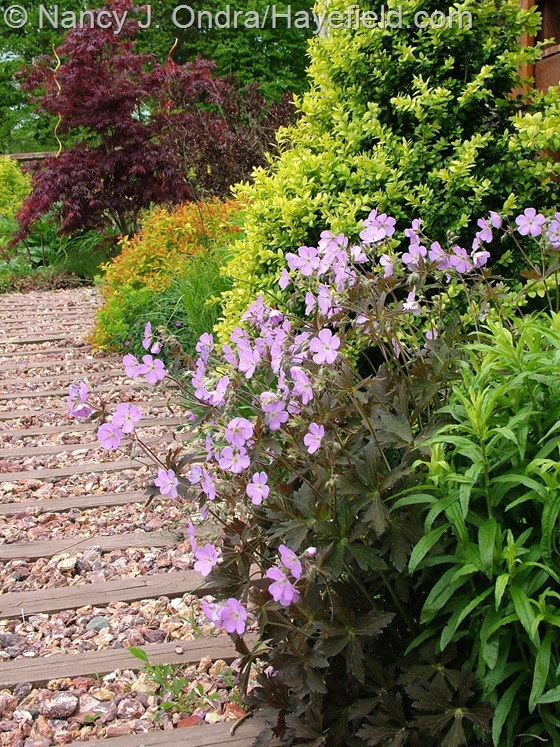 Below is ‘Espresso’ wild geranium (Geranium maculatum) against the new foliage of ‘Latifolia Maculata’ boxwood (Buxus sempervirens), Magic Carpet spirea (Spiraea japonica ‘Walbuma’), and a red-leaved Japanese maple (Acer palmatum). 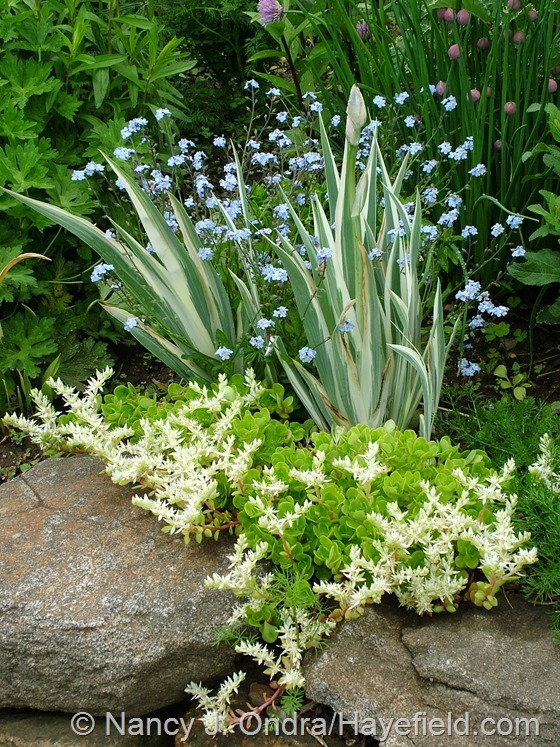 Above, white-variegated sweet flag iris (Iris pallida ‘Argentea Variegata’) with forget-me-nots (Myosotis sylvatica) and woodland sedum (Sedum ternatum). 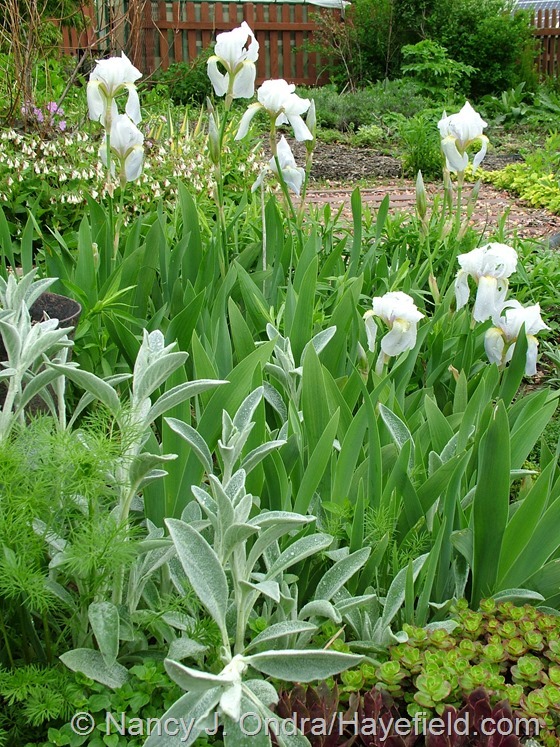 Below, orris root (Iris ‘Florentina’) with lamb’s ears (Stachys byzantina). 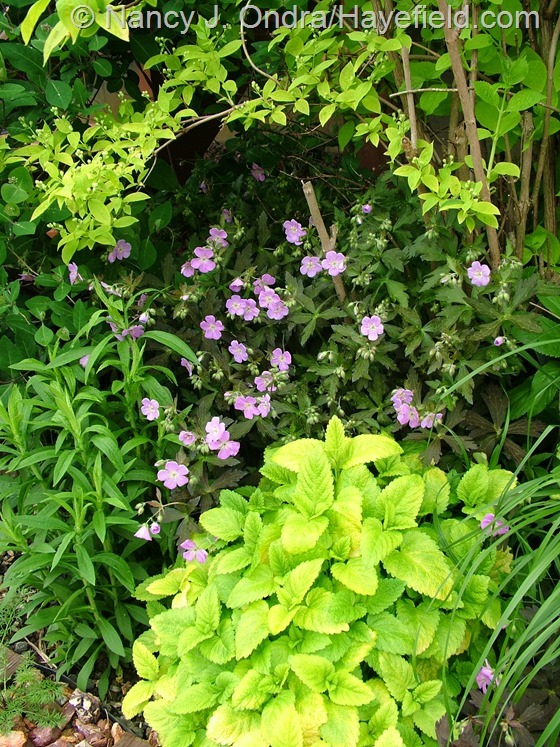 Above, ‘All Gold’ lemon balm (Melissa officinalis) and ‘Espresso’ wild geranium (Geranium maculatum) under a shoot of golden mockorange (Philadelphus coronarius ‘Aureus’). 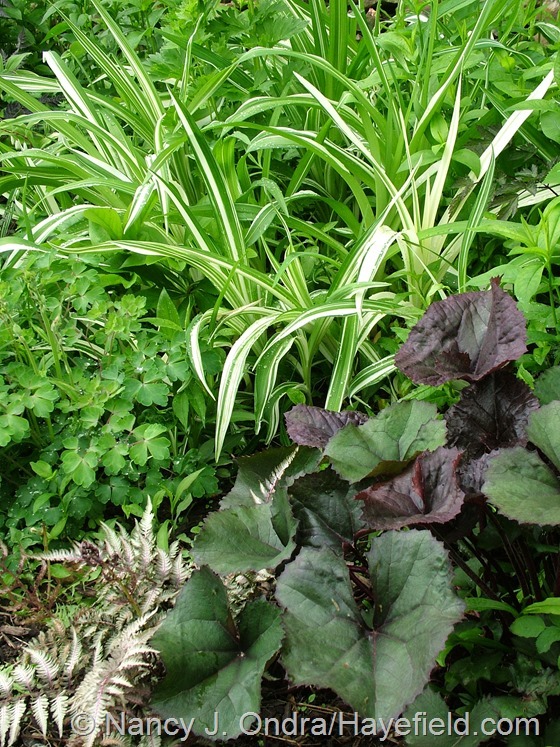 Below, ‘Britt-Marie Crawford’ ligularia (Ligularia dentata) with ‘Variegated Kwanso’ tawny daylily (Hemerocallis fulva) and a bit of Japanese painted fern (Athyrium niponicum var. pictum). 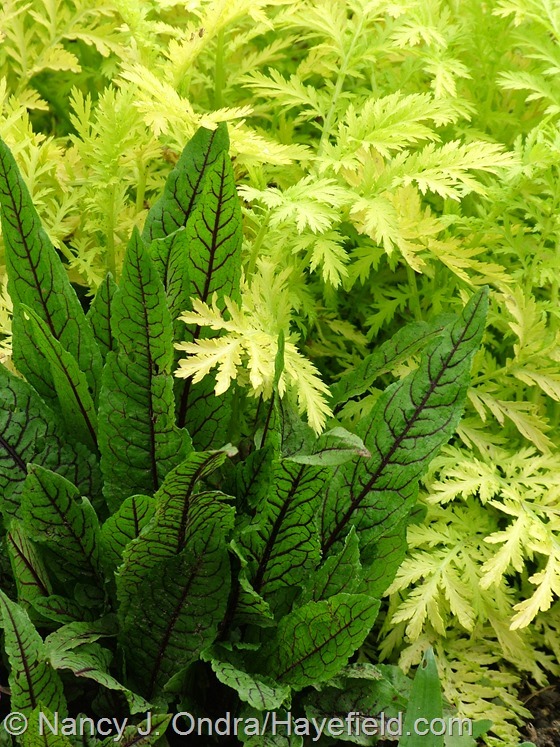 Two combos with a similar color theme: above, ‘Sun Power’ hosta with Japanese blood grass (Imperata cylindrica ‘Rubra’); below, bloody dock (Rumex sanguineus) with ‘Isla Gold’ tansy (Tanacetum vulgare). 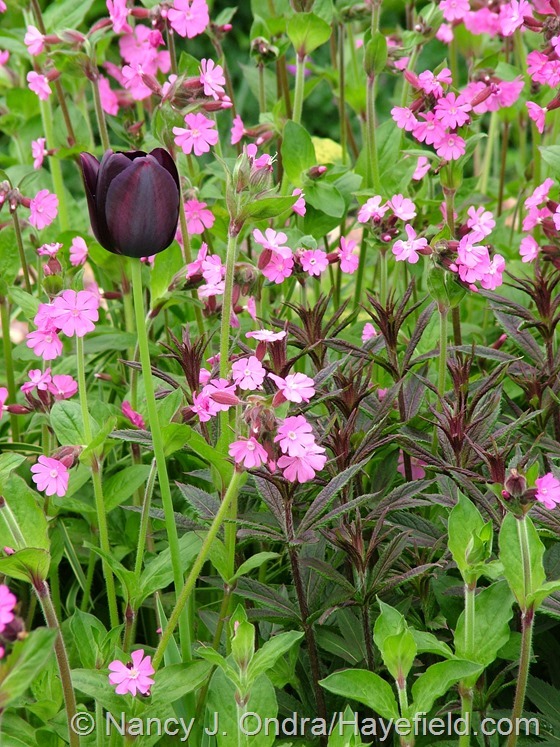 And two with a touch of purple: above, ‘Queen of Night’ tulip and the foliage of ‘Erica’ Culver’s root (Veronicastrum virginicum) with the pink flowers of red campion (Silene dioica); below, shredded umbrella plant (Syneilesis aconitifolia) with ‘Black Scallop’ ajuga (Ajuga reptans). Above and below is the alpaca-fleece path I’m experimenting with this year, lined with ‘Big Ears’ lamb’s ears (Stachys byzantina) and wild columbines (Aquilegia canadensis). The shot below includes ‘Surefire’ pie cherry and variegated rough deutzia (Deutzia scabra ‘Variegata’) to the left and ‘Concord’ grape and a kiwi vine on the fence. Above, the thinned-out ‘Red Majestic’ contorted hazel (Corylus avellana) with some species peonies in the front garden. 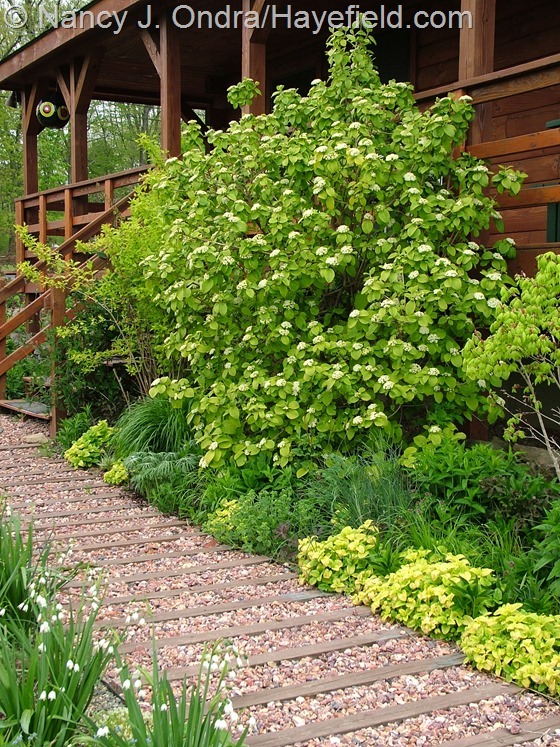 Below, the foundation border along the side porch, dominated by golden wayfaring tree (Viburnum lantana ‘Aureum’). Above and below, a couple more side-garden shots, both including the cut-back silver willow (Salix alba var. sericea). And one more bit of excitement here at Hayefield: we’ve now gone solar! We’ll have all of the electricity we can possibly use, and the boys have a spiffy shade structure in their pasture too. Well, that’s it for us this month. 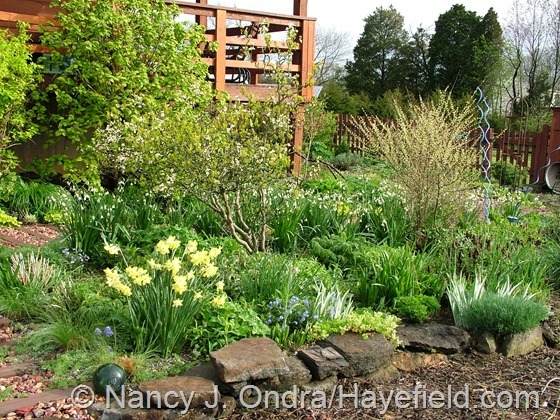 To see what’s happening in other May gardens around the world, check out Carol’s main Bloom Day post at May Dreams Gardens. Sorry about that, Rhona – I put up a corrected one. 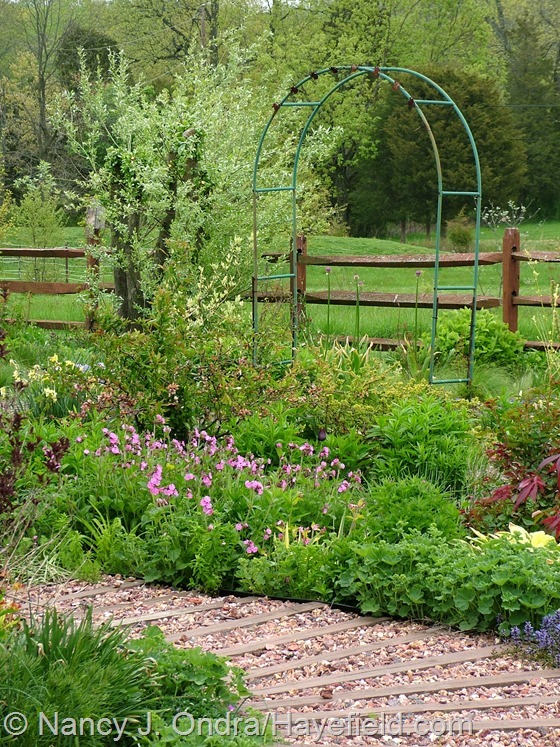 Your garden is so lovely, the way the beds are laid out with complementary colors of foliage and the meandering paths. The Alpacas are super cute! At least the paths are still visible at this time of year; pretty soon the plants will do their best to take over that space. The boys say thank you for the compliment! Gorgeous, Nan….. always a feast for the eyes. I’m licking my lips with excitement – our iris are still weeks away from blooming although the forget me nots are already sprouting blooms everywhere. You’re at least a month ahead of us… my harbinger of things to come! Good luck with the pawpaws. How exciting! Our newest venture is kiwi, but we are years away from the possibility of fruit. We went solar this spring as well! Threw the switch on the inverter on April 10th! We certainly have similar taste in plants, don’t we, Cathy? I have one kiwi here but need to figure out if it’s a boy or girl so I can get it a mate. And congratulations on your own solar project! We’re all tested and inspected and ready to go; just need the final ok from the power company, which I hope will come through in the next few days. Hi there, Allan! I hope you’ve been able to get out and enjoy your garden this spring. 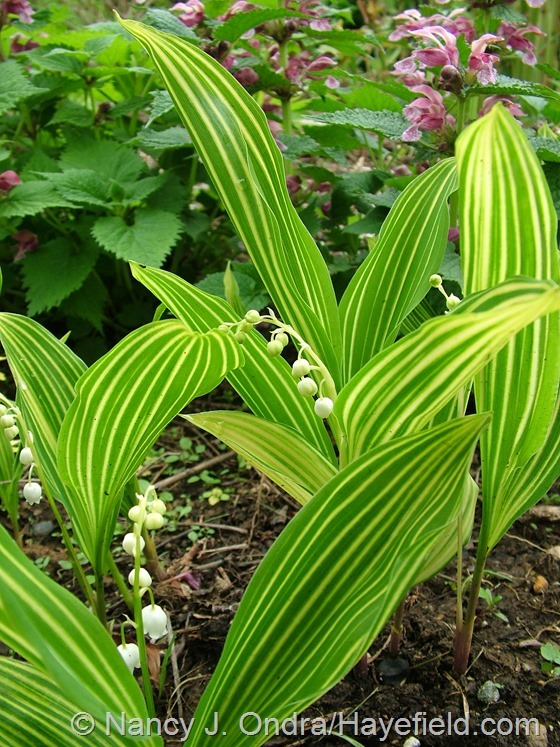 You can probably get even more kinds of variegated Convallaria than we can in the U.S.: I’ve found three here, but the RHS Plant Finder lists several more. Beautiful pictures. Wish I could see it in person. But then you’d see all of the weeds, too! It’s going to be pretty busy here over the next month, trying to get them all out and the “good” plants in the ground…not that I need to explain that to another gardener! Kewt llamas… What electrical appliances are they plugging into those solar panels? Those iris robusta look familiar…. We have those growing wild in the Middle Georgia wetlands… With genetic drift! When they self seed, they escape that clone look with every plant looking exactly the same…. I useta search for examples of wildly different ones, when I lived in an area where I could grow them…. That must have been great fun, Stone, searching for oddball irises. So far I haven’t caught the boys trying to sneak any power out of the panels, but who knows what they get up to when I’m not watching: probably trying to recharge their iPods and Kindles. I’ll be monitoring the power production through my computer, so they won’t be able to get away with an air conditioner for the barn. I have contorted hazel envy. Here is my story: Mine looked a lot like yours until Sunday night. A bear used it for a back scratch that night. Mind you, I did not see it, but since my bird feeders were also demolished and I woke up to find red leaves and various limbs with red leaves scattered on the grass, I am pretty sure it was a bear. I am pretty sure it was a bear with an itch. Mind you, I do like wildlife, I think. Thanks for the post. I really enjoy. Oh NO! And here I was getting annoyed at marauding bunnies. I’m so sorry for your poor garden. Not that it’s much consolation now, but I’ve found that the contorted hazel grows back well from severe pruning, so maybe yours will be ok…in a few months, anyway. Here’s hoping that that bear goes elsewhere for further grooming sessions! Every combination and view is more beautiful than the next. Just beautiful and you’ve given me a couple of good ideas. Great, Linda – have fun with your own combos. I think my favorite for this month was the yellow hosta and red blood grass, but there were many other nice surprises too. Congratulations on going solar! Looking forward to your reports on solar power. That iris ‘Gerald Darby’ foliage is wonderful, so I looked up your “One Plant, Three Season” post about it. I’m hoping warm weather will arrive today and stay…sitting by the fire right now as I’m working on my novel. Can’t believe it’s May 15 in North Carolina. Poor Freda – huddling in front of the fire, trying to get her chilled fingers to hold pen to paper: a great image of the struggling writer. I have a feeling we’ll all be warm enough very soon, if the forecast is anything to go by. You should be able to grow ‘Gerald Darby’ or one of the other irises like him, such as ‘Dark Aura’: they can take shallow water, even, but I have mine in regular garden soil (which, admittedly, is quite wet here sometimes but very dry in the summer). Good luck with your writing! 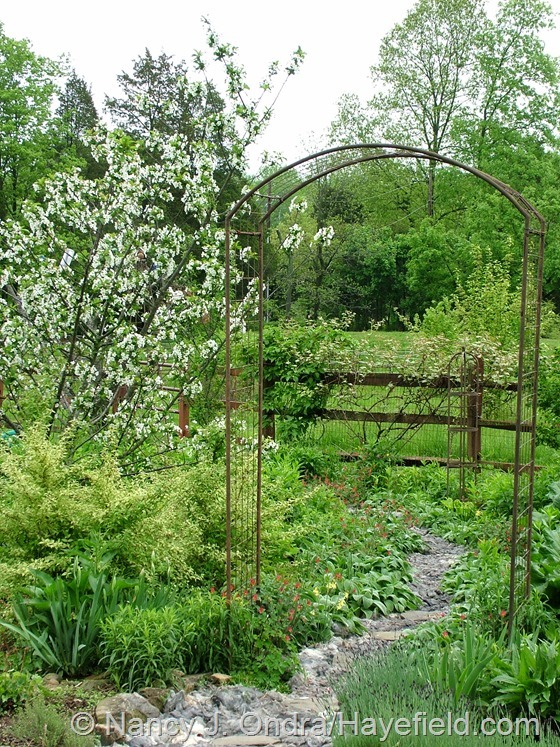 Your blooms, foliage, and well, your whole garden look spectacular. Thanks for the beautiful pictures of your truly special place! Welcome, Peter. Thanks so much for visiting and commenting today. I hope you’ve been having a delightful spring in your own garden! Wow – what fabulouos photos of the garden. Spring is slower here, but I realized this year that I must have some summer snowflakes, and I love that clematis you have. 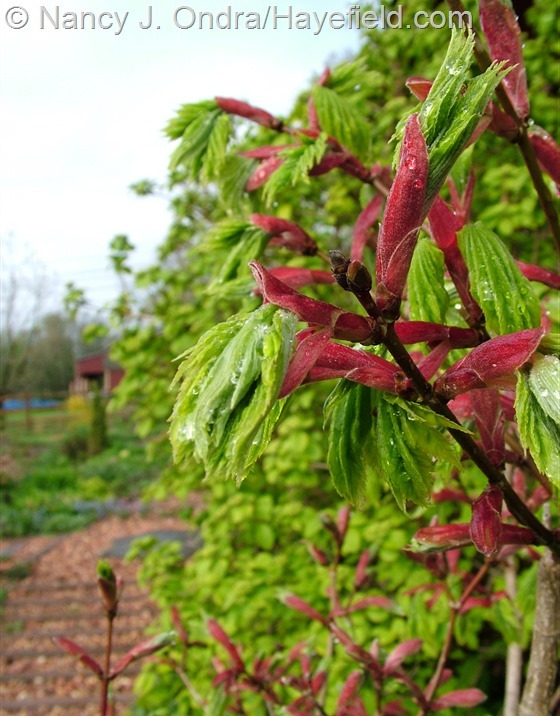 I have been unhappy with the dry April we had, but hope May will be rainier. Preferably only at night. Oh yes, let’s order up some perfect gardening weather for the next few weeks: how about nights in the upper 50s and days in the low 70s, with a mix of clouds and sun, and gentle rain every few nights to wash the pollen out of the air and settle in what we get planted? Feel free to change your order to suit your own preferences – and I hope you get it, Pat! As always, your posts are a visual lesson in great combos and a treat for the eyes! I love that alpaca fleece path, it’s just so unusual. I hope whatever experiment you’re doing with it is successful. You shared some seeds for the golden Silene with me two years ago, but I only sowed them this winter. They’ve sprouted very nicely, thank you! That’s great news about the seeds, Alison; I’m so glad they germinated for you. 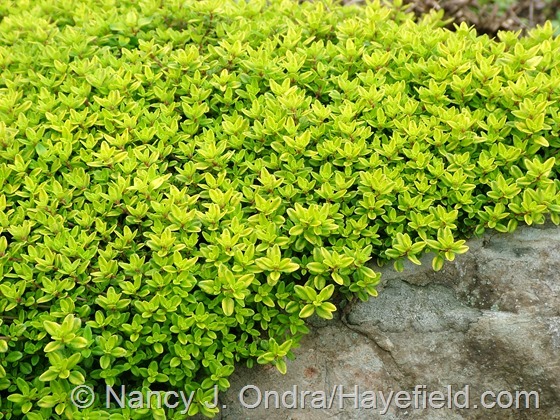 Watch out for the green-leaved seedlings: they’re pretty too, but they’re much more vigorous than the yellow-leaved ones, and they’ll happily take over if you let them. And the path…the experiment is seeing how the fleece will work (and look) as a pathway material. I was finally able to finish it last week with the results of this spring’s shearing sessions. 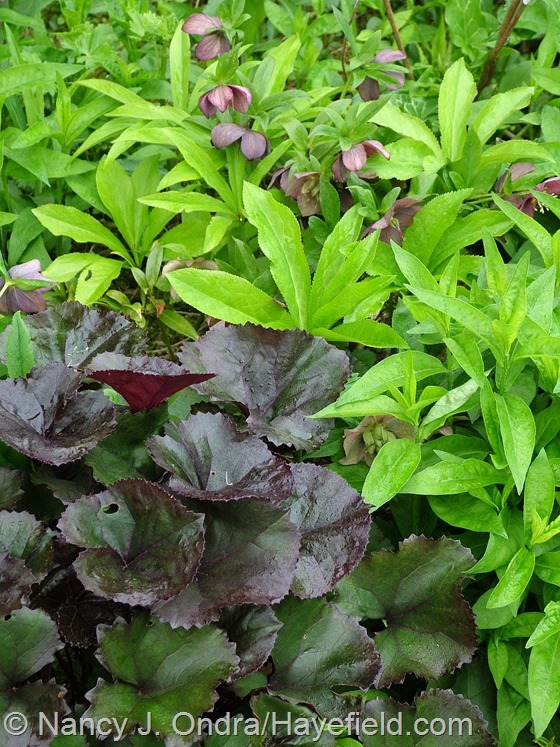 My Anchorage, Alaska garden is still brown…only the tips a few things peeping out (rhubarb, bulbocodium, peonies columbines). We had a rough winter, and I’m afraid that the bulbs not eaten by the voles have rotted (I planted 2000 last year and 1800 the year before). The moose feasted on the Evans cherry, and something mowed the blueberries almost to the ground. Thus, it is such a treat to view your garden from afar. I look forward to every one of your posts! My goodness…Greg has a bear and you have a moose in your garden???? I’m considering taking down my “Certified Wildlife Habitat” sign before some gigantic mammals decide to move in here. I didn’t realize that weasels were good for vole control, though, so I wouldn’t mind having a few of them around here. I hope it turns out that at least some of your bulbs are all right, Heather – it sounds like you really need some flowers soon. Once again you have so much going on I have to pick out the most striking as my favourites. 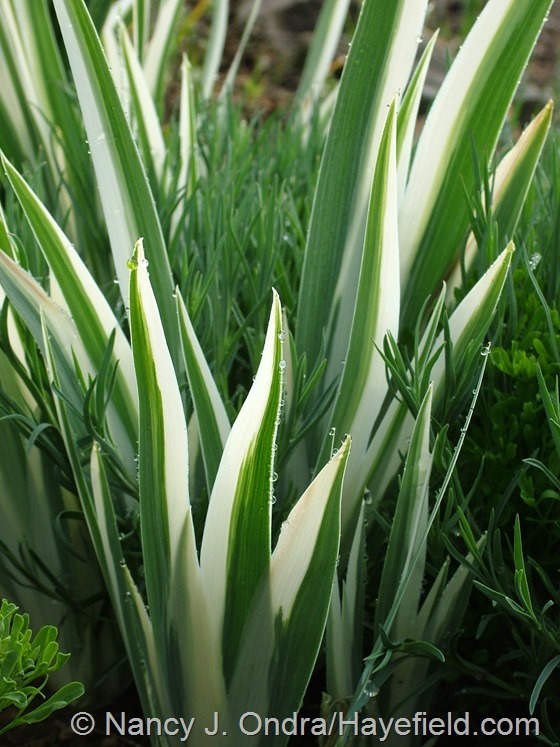 The variegated lily-of-the-valley and variegated irises are very cool and architectural. 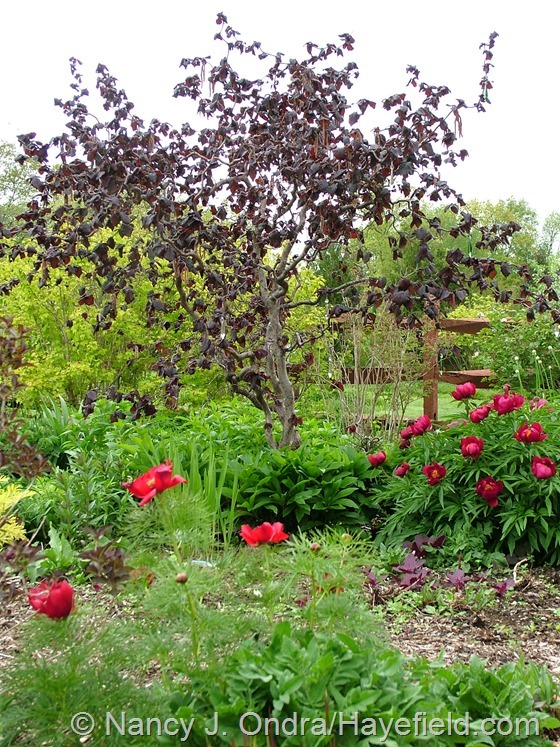 Love the almost black tulip, the deep red peonies and the contorted hazel. I don’t think any of those will grow in the tropics so have to admire them in your pics! Yeah, I doubt you’d have luck with any of those, Nicole. But then, I’m spending a lot of time recently trying to find interesting tropicals around here, so I can’t say I feel too sorry for you. Maybe we need to trade gardens for a while! That river of alpaca fleece is mesmerizing. Your garden looks beautiful, as always. Thanks, Heather – Happy Bloom Day to you! Iris with purple shoots — fantastic! Another wonderful thing about the cool spring this year: I’ve gotten to enjoy that purple blush for weeks longer than usual. Hooray for Gerald! Hi Scott! 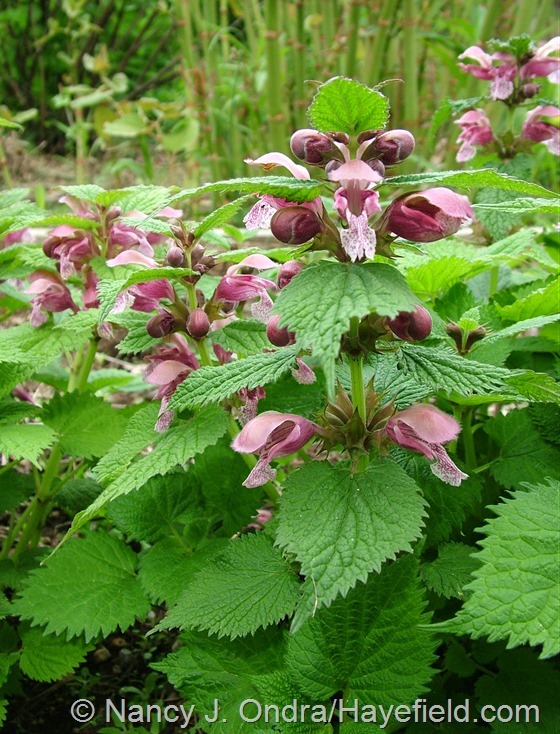 Yes, I can easily imagine that Lamium orvala would speak to you too. I was thinking that Gerald’s color was better this year because of the cool temps, but maybe it was as much due to the ample sunshine. I’m glad you like that pink-and-purple combo. It was even prettier when there were a lot more tulips, but only this one survived past the second year. Spectacular views. Love the Darby Iris. Hey, Greggo – thanks for visiting. I hope your garden is making you happy on this beautiful Bloom Day! Fantastic pictures! I also love the iris, I’ve been on the lookout for it the last couple springs since I first saw it here. 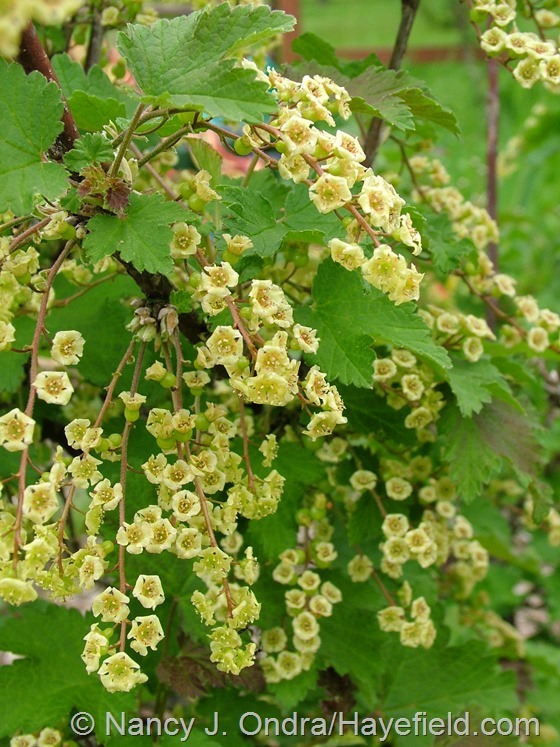 Do you collect those ninebark seedlings too? I can’t resist nursing them along to see how they turn out. If you can’t find ‘Gerald Darby’, maybe you could consider ‘Dark Aura’; I think it’s very similar. Plant Delights currently has it: ‘Dark Aura’ iris. Yes, my ninebarks produce loads of seedlings. I pull out most of them (mainly the yellow ones), but I too can’t resist growing out some of them. I’m so happy to hear that you had luck with the seeds – enjoy! 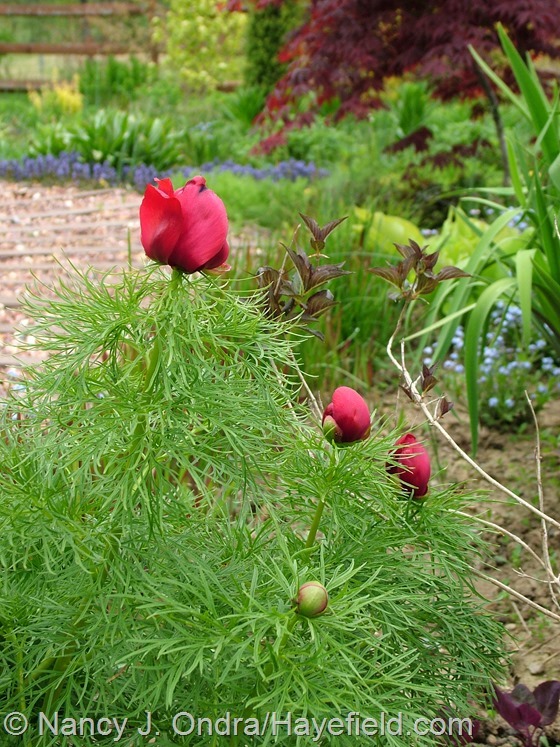 Right now I can’t think of another garden I want to visit more than Hayefield in spring. And well done with the solar! How about Hayefield in summer…or better yet, fall? This is just the beginning! And thanks – I’m so excited about the solar I just had to share. It took me years to save up for it, and many months of waiting to get it installed, but it’s going to be worth it. As always, superb! I love the fleece effect. Like a tumbling river. Oh yes – I see it! Thanks for sharing that, Layanee. I do like the rumpled look it has now that it has gotten rained on a bit. Oh Nan I must thank you. As usual your photos are just gorgeous. I have had a bleak summer with a hideous prolonged drought brought to a crashing end by the wettest Autumn I can remember. Great sunny days for the kids but the garden suffered terribly. Now the persistent and often torrential rain has made the weeds come back with gusto. Ugh. I was really in the dolldrums until I read this post. It has sparked more than a glimmer of excitement and I have some hope that my gardening mojo will return! Also I will no longer moan on about how our native moorhen (pukeko) has pulled out my euphorbia seedlings, or how the neighbour’s runaway sheep left some dainty foot holes in my lawn. Bears, mooses, voles, weasles… those are things to moan about! Crikey! Poor Kerry. Well, now you can rest up and look forward to a better gardening season to come. Yes, as I was struggling last evening to fence in my front border with chicken wire to keep the rabbits out, I was thinking how pointless the effort would be if a moose decided to drop by! Everything looks so wonderful. 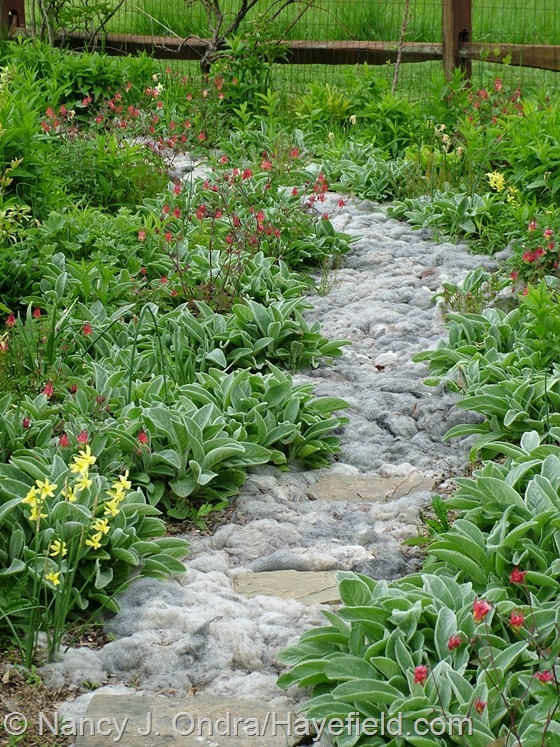 The alpaca path with the lambs ears is a brilliant idea. I am so impressed with your solar and wonder if we could do the same. Solar is definitely worth looking into, Carolyn. You could get a free consultation, at least, to find out which options might work for you. If you ever want to chat about it, you know how to reach me! Such beautiful and inspiring photos all around! The Gerald Darby’ iris is an absolute stunner! And I LOVE the alpaca path. I can only imagine the sensation of walking on it. Heck – I’d probably try sleeping on it! Also, good for you on the solar – it is definitely on my wish list! Thank you, Anna! Oh yes, the ‘paca path is a real treat for the feet. I haven’t tried sleeping on it yet, but I do have some pillows stuffed with the boys’ fiber, and they’re quite nice. I hope your solar wishes come true someday. If a full system isn’t feasible, maybe a small, off-grid system to provide temporary power during electric outages? I’ve been eyeing one on Amazon that’s less than $300. Nan, wonderful images of spring! You must be 4+ weeks behind us at this point even though we’ve had mostly cool weather up until this week. I think “your time” of spring is my favorite as it offers such hope for the rest of the year and the usual gardening traumas and tragedies have not yet occurred for the most part. The campion ‘Roy’s Gold’ that I grew from the seed you shared with me has been blooming it’s head off for the past two weeks. I have really enjoyed it as an accent in my border. The cutworms have done a number on the purple plantain but I am hopeful of their recovery. I shall not complain about them when others have to face bear and moose! I will complain about the swarming mosquitoes however… a natural consequence of about 12 inches of rain in the last month-and-a-half. Ugh! Gosh, Kate – another thing to be glad that I’m not dealing with right now. Thanks for the seed report! 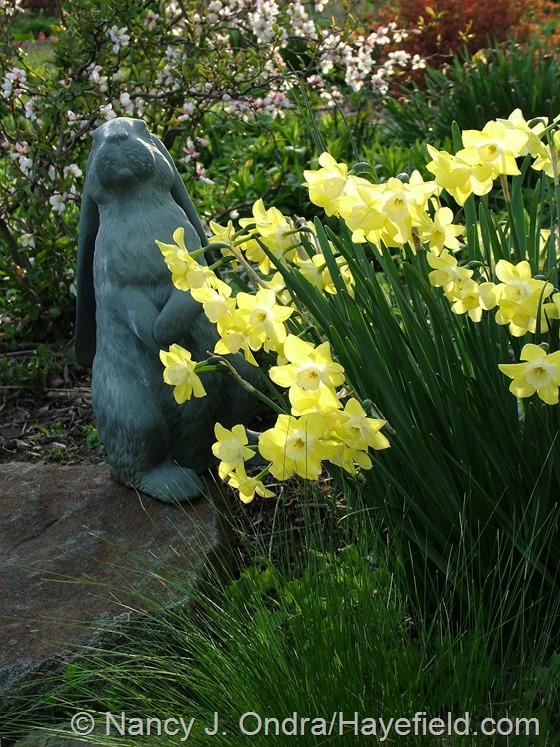 How neat that ‘Ray’s Golden Campion’ is growing in several more U.S. gardens now. It’s so easy to collect the seed that it’s a great choice for sharing with friends. Your plants and combinations are always beautiful but when I saw the ‘Gerald Darby’ Iris foliage I’m afraid I audibly gasped. 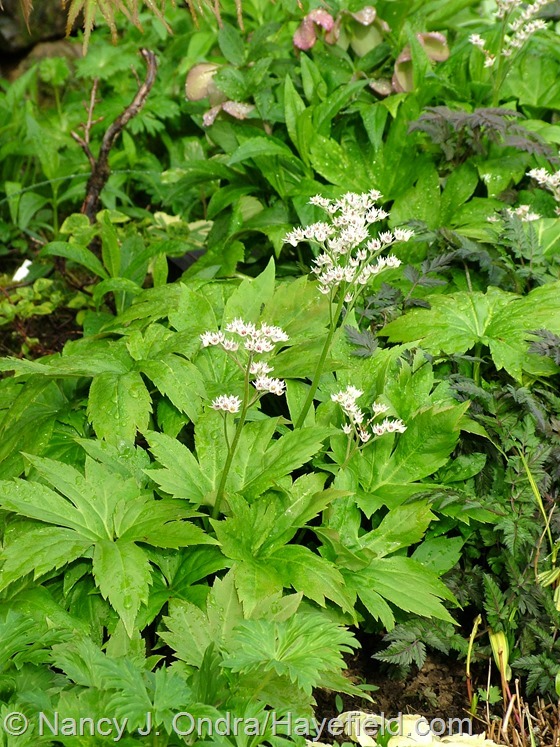 I Googled the plant and saw your earlier post on it. Too bad about the moist soil requirement – that makes it a somewhat impractical choice for me in Southern California. Thanks for sharing your garden. It is a stunner, isn’t it? I’m so sorry to taunt you with something you may not be able to succeed with, though. For anyone else who is looking for my previous post, it’s at One Plant, Three Seasons: Iris ‘Gerald Darby’. Hi Kate. 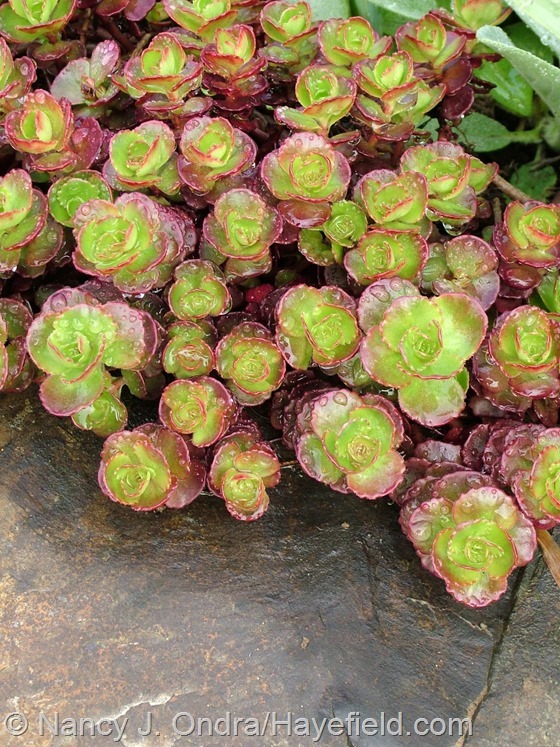 Yes, weeding ground-covering sedums is a continuing challenge. I try to weed early and weed often, and only when the soil is moist, so the seedlings are small and come out more easily. Did you mean the timber-and-gravel path? 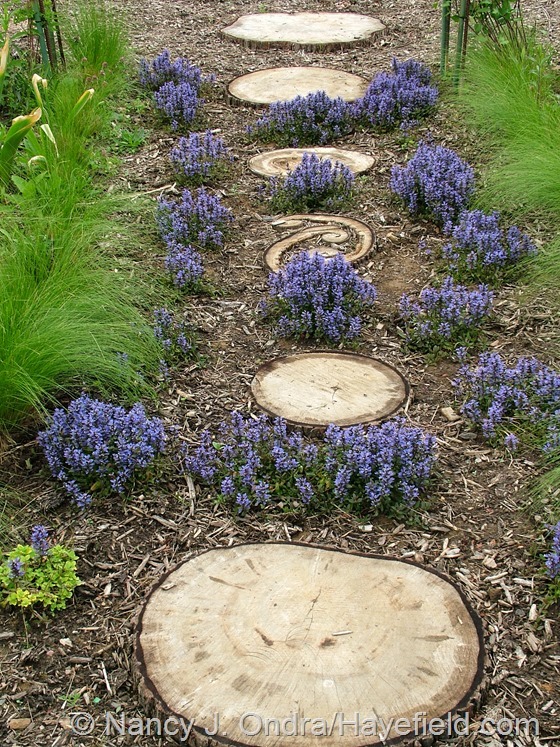 If so, you can find out how Mom and I did it in one of my old posts at Gardening Gone Wild: Walk This Way. I did mean that path. Thank u! Exciting, intoxicating, invigorating, inspiring!!! 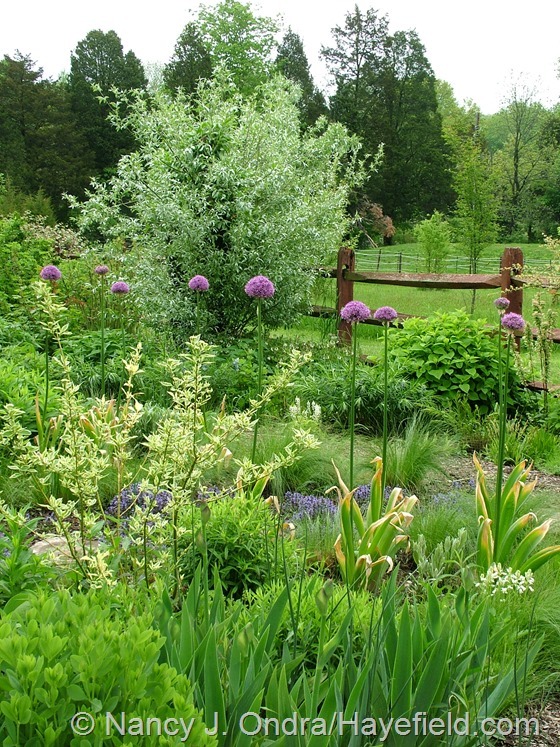 Thanks, Nan, for sharing your gorgeous garden, your planting combos with us. Speaking of combos, the Gerald Darby Iris is a new one on me and certainly can stand on its own. I’m guessing the purple colouring softens to green as the blooms appear? Is there any fall colour in it? I wonder if it’s available here in Canada…. You guessed right, Barbara: even now, the color is a much softer purple, and it’s pretty much gone by the time the plants bloom a few weeks from now. It has yellow fall color, too: not as bright as a true Siberian, usually, but still a good show. I hope you can find some to try. I’m SO happy to hear that you and your family are all right, Dee – thank you for the note. I’ll be over to check out your post. Thank you for allowing us to enjoy your Spring with you! Hey there, Shady – great to hear from you! I hope all is well with you and your garden. I’d glad I could show you something new to lust after; it’s worth the hunt. Thanks for stopping by! Hi Nan – Thanks for that shot of Queen of the Night ruling over her court of pink. The bulb catalogs would do well to show inspired combinations like yours. So many lovely new varieties – Mostly Ghostly – how is it that I’ve never see that before??? Ditto for Gerald D. So many plants to add to the wish list. Best of luck with the paw-paw and keep us posted. You do know that they have fierce underground runners…..
Maybe I’ll regret saying this 10 years from now, but at this point, I’d be very happy to see them form a nice patch. There’s room for them to do it down there, and I think they’d look great. We’ll see!